Zion Market Research has published a new report titled “Benzoic Acid Market by Applications (Benzoates, Benzoate plasticizers, Benzoyl Chloride, Alkyd Resins, and Animal Feed Additive) and by End-use Industry (Food & Beverages, Chemical, and Pharmaceutical): Global Industry Perspective, Comprehensive Analysis and Forecast, 2017 – 2024”. 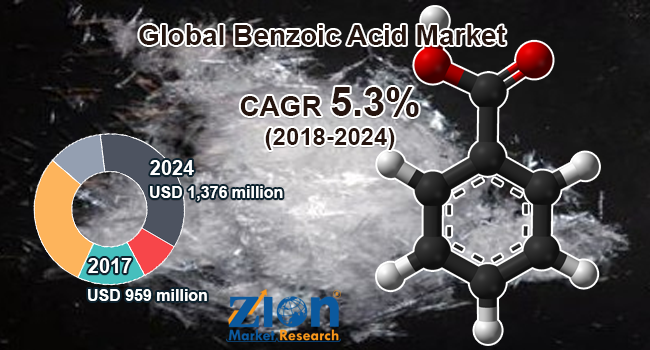 According to the report, global benzoic acid market was valued at USD 959 million in 2017 and is expected to reach USD 1,376 million in 2024, growing at a CAGR of 5.3% between 2018 and 2024. Benzoic acid is a fungicide, bactericide, viroicide, and virucide, which is used for disinfection. Benzoic acid occurs naturally in many plants and in animals. Therefore, it is a natural constituent of many foods including milk products. Benzoic acid is an odorless chemical, which is used as a chemical reagent. It is extensively used as an additive to obstruct the growth of fungus and bacteria in the food & beverages industry. In 2017, benzoic acid was increasingly used for several applications. The rising consumer demand for benzoic acid is anticipated to boost the market. The positive response by the government for the green environmental policies and the raw material availability are factors that will help in enhancing the market growth in the near future. The increasing demand for packaged food and beverages especially from the emerging economies is the major key factor that is driving the market growth. Availability of alternative cheap substitutes and fluctuating prices of the raw materials may hinder the market growth to some extent. The manufacturing companies are focusing on developing innovative products thus opening great opportunities for the market. On the basis of application, the global benzoic acid market includes benzoate plasticizers, benzoates, alkyd resins, benzoyl chloride, and animal feed additive. Majority of benzoates are used as an intermediate in the production of other organic compounds. The benzoate plasticizers segment is anticipated to be the fastest growing application segment of the benzoic acid market during the forecast period. Based on end-use industry, the pharmaceutical sector is estimated to be the fastest growing end-use industry of the global benzoic acid market during the forecast period. Benzoic acid as an antimicrobial preservative and antifungal agent is widely used in the pharmaceutical segment. Food & beverages application segment accounted for more than 45% market share in 2017 and is projected to maintain its dominance over the forecast period. The chemical industry also has an increased demand for the benzoic acid thus boosting the market growth. Increasing investments in the oil & gas refinery processing are also projected to augment the demand for benzoic acid over the forecast period. The growth of the pulp and paper segment is directly attributed to the growth of the paper recycling industry. The food & packaging end-user segment expected to be the major growth driver for the benzoic acid market in the forecast period. The Asia Pacific was leading the benzoic acid market in 2017 both in terms of value and volume. Moreover, Asia Pacific is also anticipated to be the fastest growing regional market for benzoic acid within the forecast period. It is expected to witness great perspective to surge the requirement for benzoic acid. Following the Asia Pacific, Europe was a second largest market. This growth can be anticipated to the growing preference of the consumers towards ease food and ready to drink beverages owing to their busy lifestyle. Furthermore, the increasing population and changing the lifestyle of people is also having a positive effect on benzoic acid market growth. Some of the major players of the global benzoic acid market include Emerald Performance Materials, Tianjin Dongda Chemical Group, Wuhan Youji Industries Co., Liao Ning Huayi Chemical Industry & Commerce Co., Ganesh Benzoplast Limited, Shri Hari Chemicals, Hebei Smart Chemicals Co. Ltd., Merck Group, Novaphene Specialties Pvt. Ltd., Chemcrux Enterprises, Apollo Scientific, Shree Chemopharma Ankleshwar Pvt. Ltd., and Clarion Drugs Ltd., among others. Major companies in the market are adopting expansions, acquisitions, and mergers strategy to expand their production capacities and share in the benzoic acid market in the forecast period.